My sister-in-law is an amazing woman. Kind, caring, and it seems like sometimes she takes care of everyone but herself, so I thought she deserved to get a little reminder in the mail: A care package full of her favorite things for a relaxing spa day! 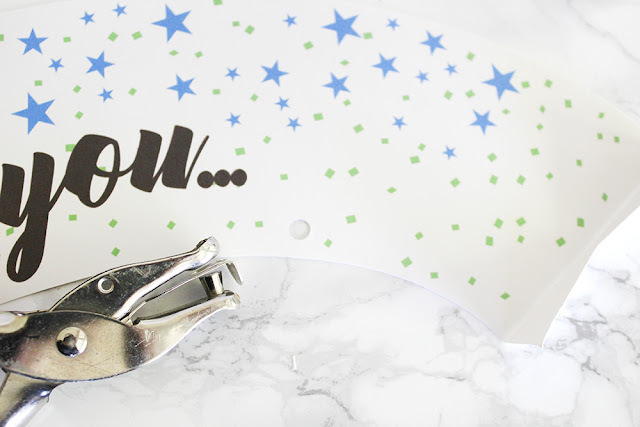 I created some fun printables, like a pop-up banner, candy wrappers, and a "Do Not Disturb" door hanger, to make this self-care package special. You can find those along with instructions on how to put it together with AVEENO® products from Walmart below so you can send a sweet care package to someone that needs it. 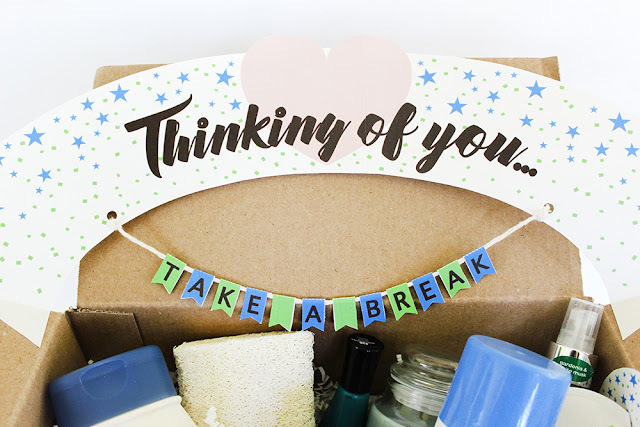 This care package is a great reminder to those hardworking ladies that they should take some time for themselves, too. A lot of times we just don't; There are too many other things to do in the day. My SIL is one of those, and because she lives so far away I thought this would be a great way to make sure she takes a break. I mean, who could resist this care package?! 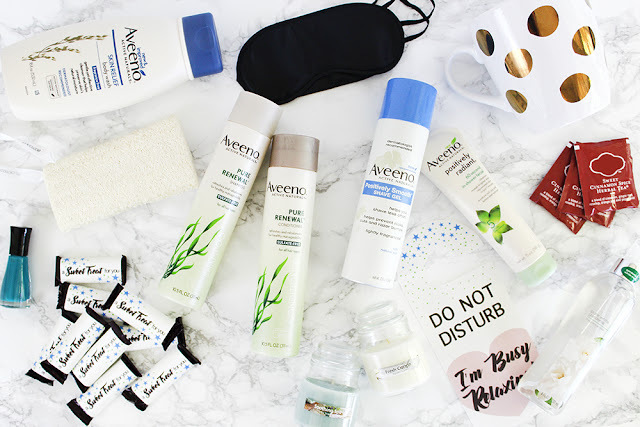 She is a huge fan of bath stuff, and loves AVEENO® products in particular, so I filled her box with everything she would need to have a relaxing self-care day. Of course all of the hair and body products are from AVEENO®, and it's no wonder she's obsessed. I'm a little obsessed, too! I've included the AVEENO PURE RENEWAL® Shampoo and Conditioner. 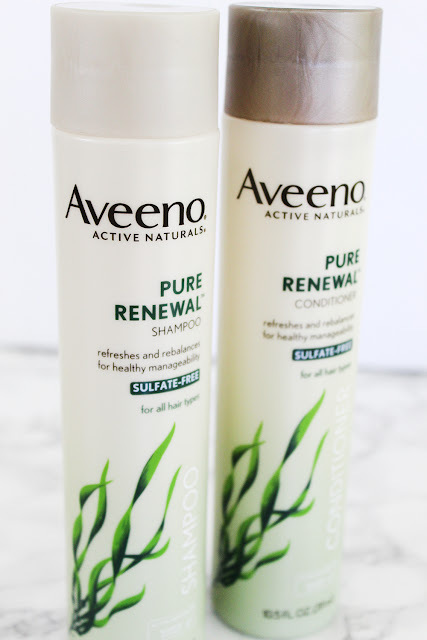 Their sulfate-free formulas help to rebalance hair’s optimal moisture to leave it feeling shiny, healthier looking, and more full of life. 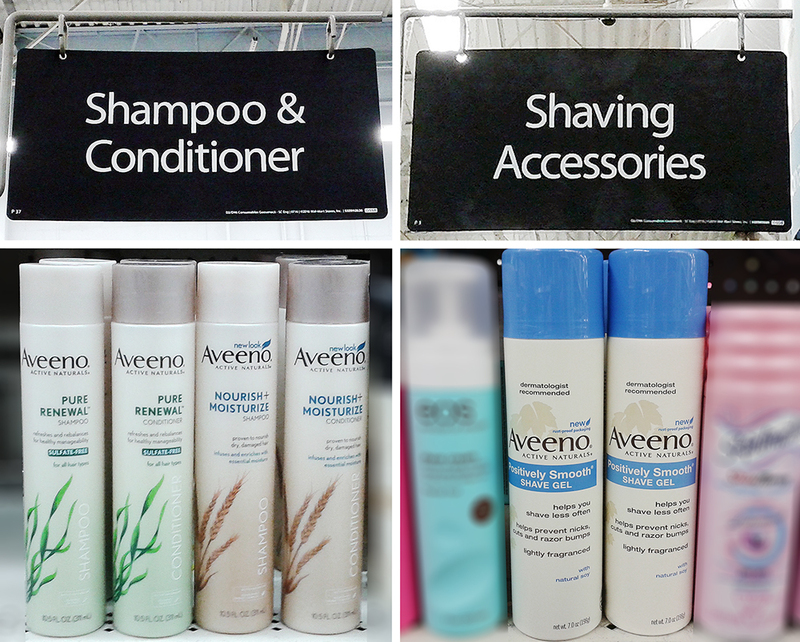 They remove impurities and renew hair to its most balanced state with each wash! Their dye free and safe for color treated hair formulas are clinically proven to be mild enough for sensitive skin and scalps. I also grabbed the AVEENO® POSITIVELY SMOOTH® Shave Gel. 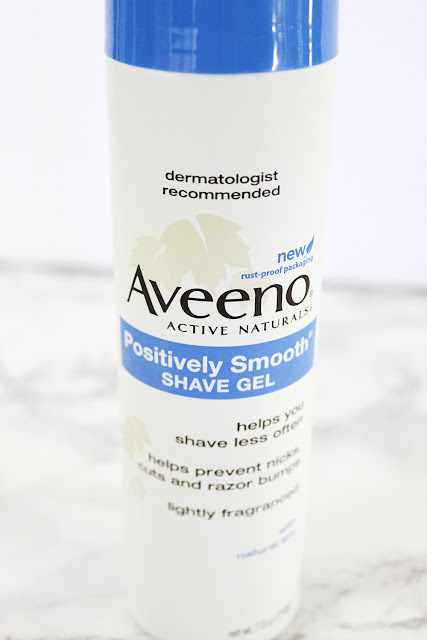 It helps you shave less often and helps prevent shaving irritation, so your skin stays softer and smoother for longer. It contains a combination of natural soy extract, oat, aloe, vitamins E and skin conditioners and has been shown to naturally minimize the reappearance of hair with use so you can shave less often. It immediately softens and conditions hair, making it easier for you to get a close, smooth shave with a light, natural scent. It soothes your skin to help it look and feel healthier and is gentle enough for even sensitive skin. You can pick up everything AVEENO® at your local Walmart in the Health & Beauty section. Be sure to get your $2.00 off coupon here first, then let's get to making our self-care package! 2. Match up the crosshairs on the two sheets of the banner and glue them together. Allow to dry. 3. 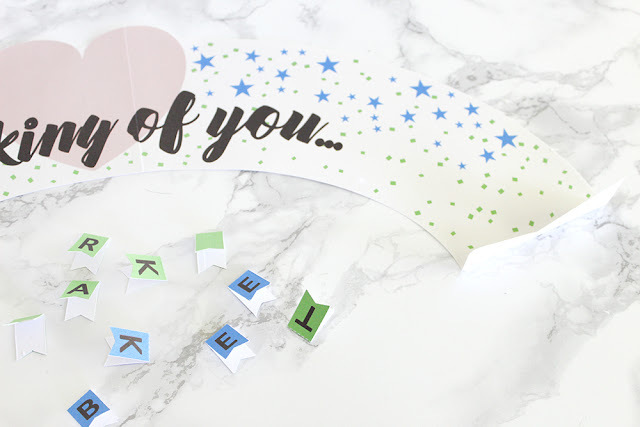 Cut out all of the elements of the banner, the door hanger, and the mini candy bar wrappers. 4. 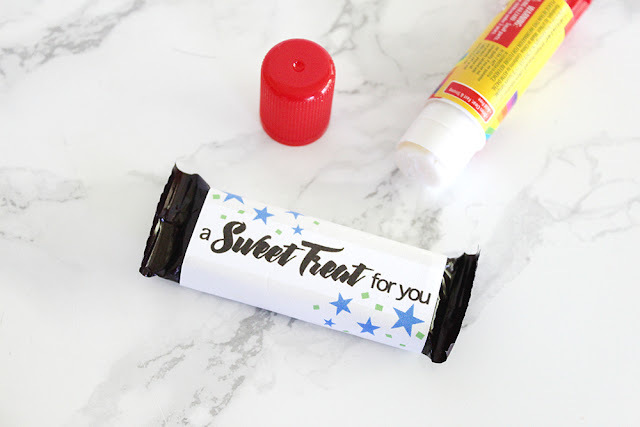 To apply the candy bar wrappers, apply glue to the grey strip, wrap around your bar, and press to close. 5. Crease and fold all of the flags in half and the darker ends of the banner as shown. 6. Use a hole punch of something sharp to punch a hole where indicated by the two white dots on the inside edge of the banner. 7. 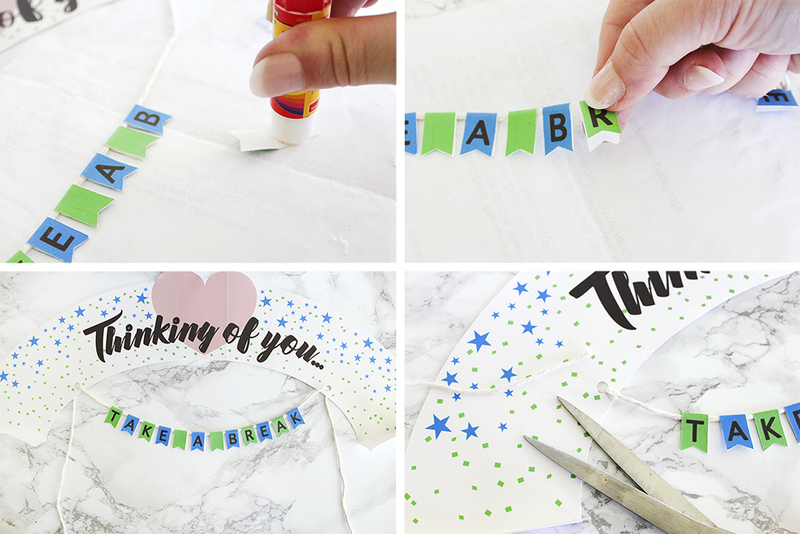 Arrange your letters and cut a piece of twine long enough to tie off on each end. 8. Apply glue to one side of the flag, wrap it around the twine and press to close. Repeat until finished, then thread the twine through the holes to the desired length. Tie off and clip the excess twine. 9. Apply glue to the back side of the banner ends, line them up with the back edge of your outer flaps (the flaps that will be addressed) and press. Apply a bit of glue behind the heart and press to adhere to the back flap. Allow to dry. 10. 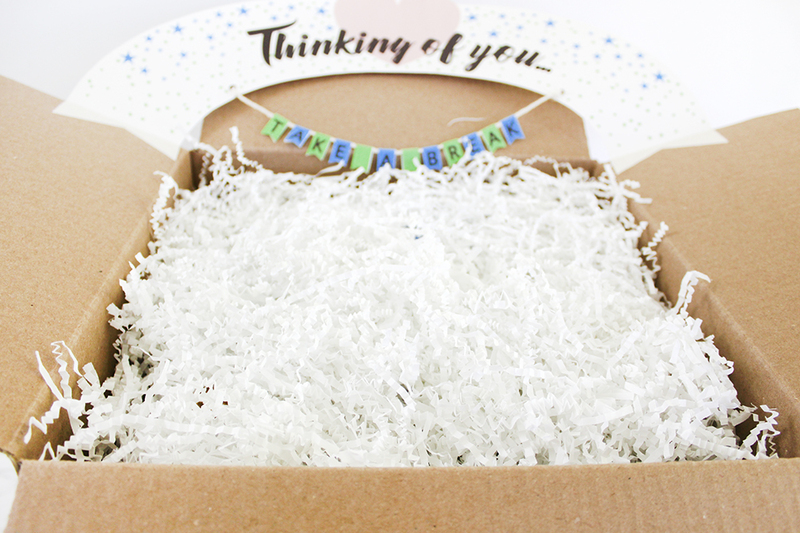 Gather your care package items, fill the box with half of the shredded crinkle paper to cushion, and arrange your items. 11. Use the other half of the shredded crinkle paper to pack on top of your items. 12. 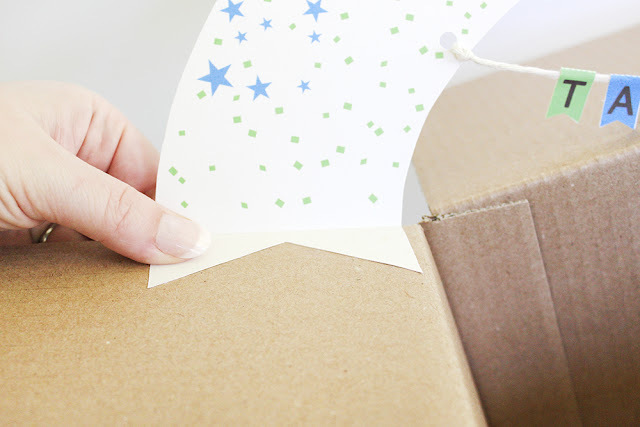 Cover with a sheet of tissue paper and tuck the ends in well. This will keep anything from catching and pulling your hanging flag banner. 13. To close, fold the front and back banner flaps down carefully. The ends of the banner attached to the side flaps will fold over on top when you fold over the side flaps. 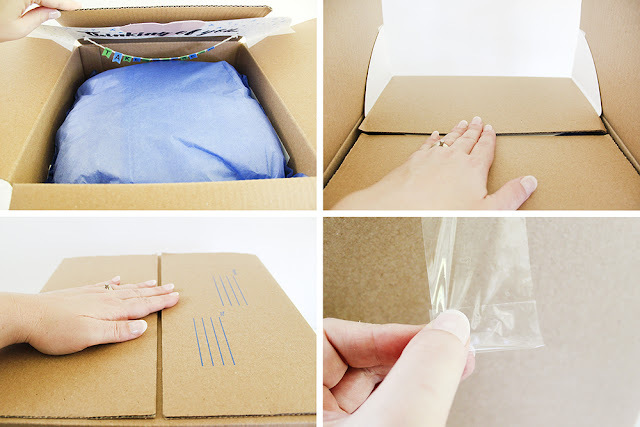 Run a length of shipping tape over the box seam, but don't press down yet. Take the end facing you and fold the edge of the tape to the back, forming a pull tab. Press your tape down to secure the box. 14. You can place another short length of tape horizontally above the pull tab to make sure it doesn't accidentally get pulled in transit. 15. 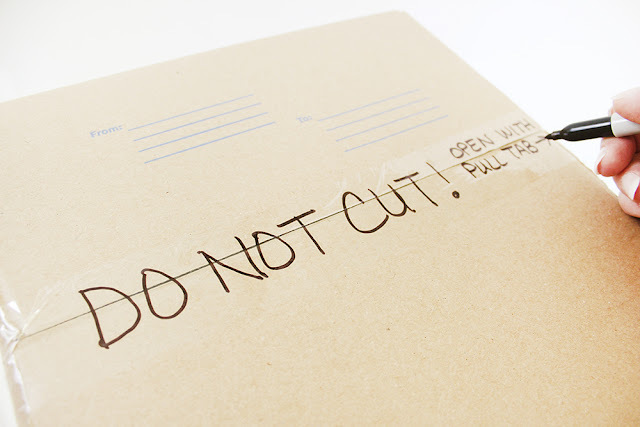 Make sure to write DO NOT CUT on the top of the box. You want to make sure they don't cut through your pretty banner! Ta-da! 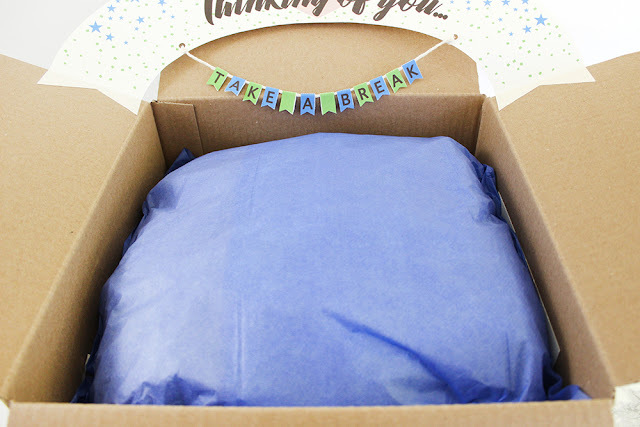 Now you have a super-fun self-care package to send to a loved one that needs to take a break! 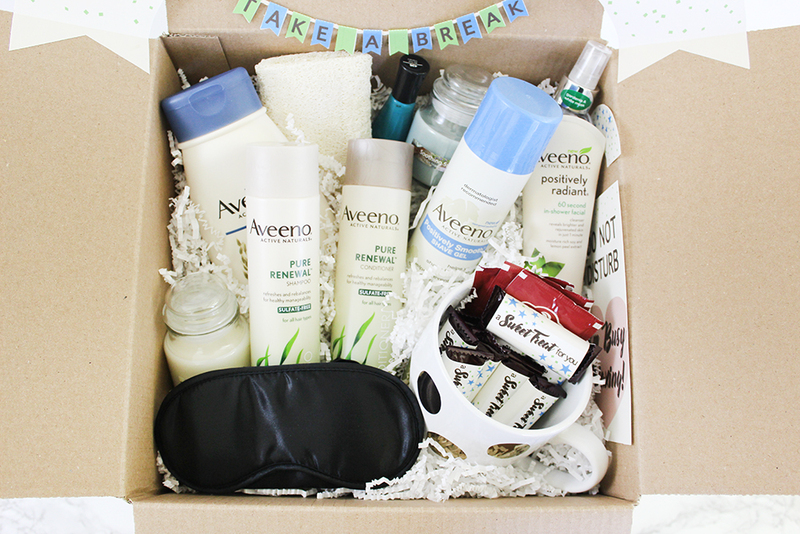 Do you know someone that could use a self-care package? What would you include? I love to read your comments!